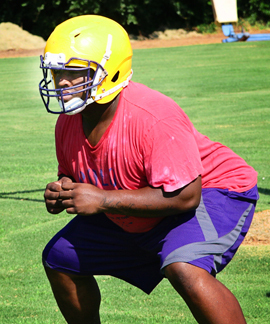 "He's something in that weight room," Tallassee Head Football Coach Mike Battles said of Zeryes "Z-Man" Rivers. Fans see the figure on the field. His work in the weight room may be even more impressive. "He's a good athlete," Battles added. "I know you don't look at a nose guard, offensive tackle type and say 'good athlete,' but he is. He can move really well. He's got great explosion and he's quick." And how about the work in the weight room? "The last time we maxed out, he benched 385 and missed 400 just by a hair. I've stopped him everytime at 500 pounds on the squat. I won't let him go any higher because there's no reason to. He's got a lot of ability," said Battles. Last season, the spotlight was on all-state running back Brandon Baynes. Much of that focus will likely shift to Rivers for his senior season in 2015. College coaches are already taking notice according to Battles. "He's gotten some interest. I've been getting e-mails and sending out information. I'm sure he's going to have some opportunities to play at the next level." Rivers is 6' tall and weighs in at 305 pounds. "He's just got the perfect build. He's made to play offensive and defensive line," Battles noted. "He's a heck of a drive blocker. At nose guard he's a two-gapper. He's going to be double-teamed most every play, and he still gets past them and runs people down." A guy that good has to play both ways. Last year Battles said Rivers played about 80 percent the time. "We try not to have him on any special teams. We'll spell him when we have opportunities. You want to rest him when you can, but the bottom line is in high school football you're going to have your best players out there. It's bad coaching to have them standing next to you." This will be Rivers third year as a varsity starter. Tallassee opens its season at J. E. "Hot" O'Brien Stadium vs. Notasulga on Aug. 21. The Tigers won 49-0 last year.